It’s been seven years since a Sociology 300 profile has been submitted. Peter was the person that put an end to that streak. In the past I would try to take the answers to the various questions to construct a narrative profile. Peter had so thoroughly answered each question it didn’t make as much sense this time. So, below, is exactly how Peter answered the question. I thoroughly enjoyed it; I hope you do too. If you’d like to profiled, then please take some pictures, complete the questionnaire, and email the University of M.U.S.C.L.E..
I’m not on Facebook nor am I a member of LRG. I used to belong to a Yahoo! Club/Group back in the early 00’s known as O’s Rawkin’ Toys, which I cofounded with an online friend and fellow M.U.S.C.L.E. collector, Chris Olian. I was, also, a member at a Yahoo! Club/Group that was called Little Rubber Guys that was founded by Lori Franc. Both places are long since defunct, but are well worth mentioning for having been stellar communities. I was, also, a M.U.S.C.L.E. Preservation Society member that helped to get its founder, Darrin Vindiola’s M.U.S.C.L.E. collection back. How did you play with your MUSCLE’s as a kid? There was a lot of play that involved brawls out on the sidewalk, the backseat of my parents’ car during family trips, restaurant tables, out on beaches during fishing trips, and every other place I played as a child. M.U.S.C.L.E. figures were the perfect size and I had at least a few of them with me everywhere I went during the height of their popularity, even at school with them being easy to conceal. Do you, and how, do you play with them now? I don’t play with my M.U.S.C.L.E. figures nowadays other than with the Hard Knocking Right. I mainly just take them out and look them over. I do have a story that I would like to share that involves playing with them as an adult. Back in the early 00’s after I had gotten the Internet and had started collecting them again, I used to play a game with them with my friend, Shane. He sadly passed away in 2016 at the age of thirty-two. I met Shane while I was in high school. I was a senior at the time and he was a freshmen. After I graduated in ’98, he used to stop by and we’d hang out. Shane didn’t have M.U.S.C.L.E. figures when he was a kid, but he was a huge wrestling fan. The game we played involved a custom ring that I had made. It was the bottom of a cardboard Tamiya model box that had a cloth stretched over it and stapled to a plank of wood on the underside of it. It had four nails hammered into the top of it and had rubber bands that stretched around them. The end result was a ring with a nice simulated matt and ropes. As for the game itself, it was turned based and best two out of three. The goal was to bounce a figure off of the ropes and into the ring and pin the opponents figure that was standing across in it. Sometimes the figure would make the pin, sometimes it would miss or just knock the other figure over not pinning him, and sometimes the figure in the ring would make a counter pin, which counted as a pin for the figure that was initially in the ring. Counter pins were common and my favorite element of the game due to their unpredictable nature. I remember the skinny Warsman was very good at them for some reason. Also, I remember if a figure flew out of the ring, it would stay there until the next turn and the player would bounce their figure off of the ropes and outside of the ring to try and pin him on the ground. The game was filled with skill, dumb luck, and advantages based on the type of figure being used. I remember the figure with the saw blades was insane to try and pin because figures would just bounce off of him. Also, on a few occasions, we worked props into games like miniature tables, chairs, and a LEGO latter. All of this made the game a lot of fun to play. I remember we would play elimination tournaments until the last M.U.S.C.L.E. left in it won. Why did you like MUSCLE figures as a child? I liked M.U.S.C.L.E. as a child because there were a lot of them and each figure was packed with a lot of character and detail that kept the gears of my imagination well-greased. 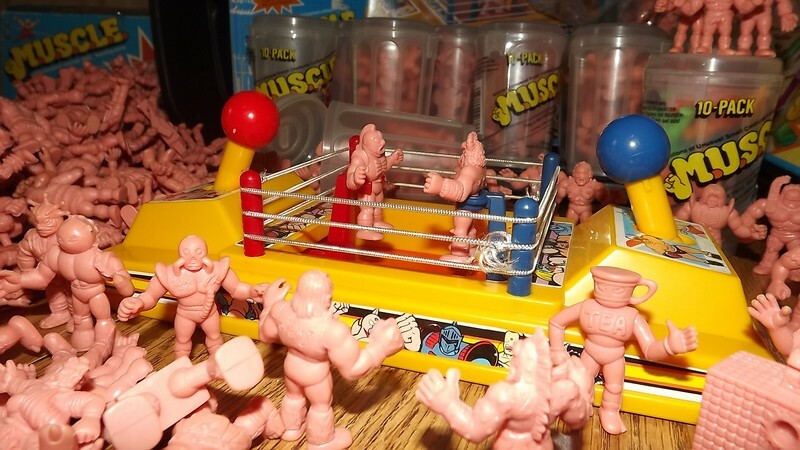 Like most American kids during the 1980’s, I was ignorant of Kinnikuman and only had Muscleman and Terri-Bull to go on and used my imagination to interoperate who and what the rest of the figures were. When did you start collecting MUSCLE? I started collecting M.U.S.C.L.E. in 1986 when they first came out. I was in 1st grade and six or seven years old at the time. As to why, I saw the news style commercial on my grandmother’s television and was instantly captivated. The funny thing is that I didn’t catch the line’s name, but I did remember part of a line from the commercial, “I don’t know what’s.”, which I thought might have been what they were called. I had to get my hands on the little guys and I asked my mother to take me out looking for them as soon as she returned home that day. Where did your first figures come from? My first M.U.S.C.L.E. figures came from Toys ’R Us, which is still in business today. My mother and I could not find them there, so we asked a worker that was on a latter. My mother mistook him for a woman due to his hair until he turned around and she saw that he was a guy with glasses and a mustache. She apologized for referring to him as “miss” and after we did our best to describe what we were looking for, he immediately took us over to a shelf that had a display with a bunch of ten packs. I, also, saw a bunch of four packs next to them that day. The ten packs seemed to be a better deal, so that’s what we went with and we purchased one with an orange Toys ’R Us price tag sticker on it. I remember getting home and opening the can up on my grandmother’s couch. I remember four of the figures that I got that day, #19, #22, #206, and #208. I was hooked between the character, detail, feel of the material that they were made in, and the fact that there were hundreds of them to collect. 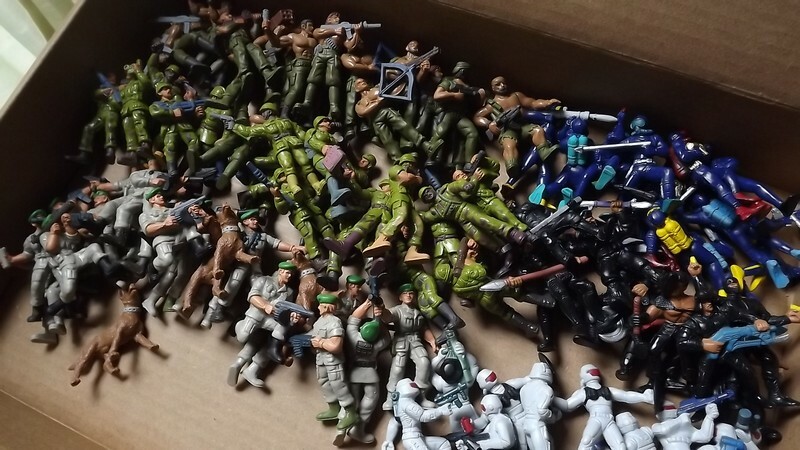 As an adult collector, my first figures were eight green ones, which I still have. I got them as a lot on eBay in March of 2000. When I got the Internet that year, I became overtaken by nostalgia after visiting early M.U.S.C.L.E. websites. I got the remaining childhood ones down from my attic and then started collecting them again using eBay. I didn’t have a lot of them left from my childhood. I had sold a lot of them off at school during the late 80’s for a quarter apiece to make money for other toys. As far as eBay went, I remember there weren’t a lot of auctions for them back then. I remember times when there were less than half a dozen of them at any given time. Compared to today, that’s pretty crazy. What is the focus of your MUSCLE collection? The focus of my M.U.S.C.L.E. collection was a full set of flesh, which I completed in 2001 about a year after starting it. What is your favorite piece you own? My favorite M.U.S.C.L.E. piece that I own is the Satan Cross figure. I guess because it’s a “rare” figure one can actually own. It’s, also, the reason why I met my online friend and fellow M.U.S.C.L.E. collector, Matt Davis in 2000 who would later pass away in 2011. He was the first friend that I had made online and one of the coolest people that I ever knew. He was a musical genius that could play any instrument he could get his hands on, a renaissance man if there ever was one. He had his own solo projects and he played in a number of bands that ranged from Metal to Ethereal. What is your favorite piece that you don’t own? My favorite M.U.S.C.L.E. piece that I don’t own is actually not a M.U.S.C.L.E. figure at all, but a part of the line’s early online history. It’s the figure from the Ramenman spinoff that was referred to X-2 and The Futuristic Goalie in the early 00’s. It’s a cool looking figure and the amount of hype and mystery surrounding it back in the day was most memorable. I remember interviewing Brant Snell via email and he sent me a picture of a green one, which I circulated to my online buddies, Matt and Chris. Chris broke the news to me when it was finally revealed as to what it was and I then broke the news to Matt who sadly had to sell his M.U.S.C.L.E. 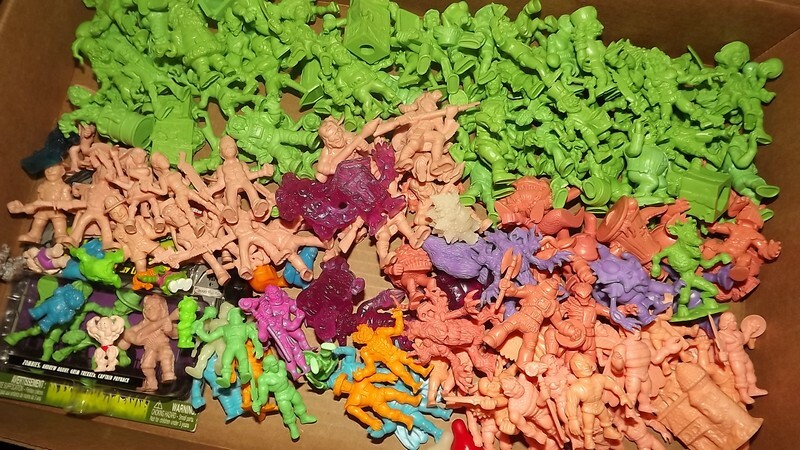 collection a short time prior in one of the biggest auctions that I had ever witnessed with over a five hundred figures that included a full set of flesh, a colored set minus two figures, sealed ten packs, and every M.U.S.C.L.E. related toy of the 1980’s like the ring, board game, and so on. What is your “holy grail” that absolutely must become part of your collection? There’s no holy grail for me. I completed my set in 2001 and bought some colored figures afterwards and never looked back until recently when I purchased over five hundred of the little critters from Matt’s sister this year (2017). Matt had gotten back into collecting them during the late 00’s and, indeed, amassed quite a collection of them. Do you keep track of your collection? How? I keep track of my collection by being a highly organized neat freak with the mind of an archivist. What are your MUSCLE collecting idiosyncrasies? As for idiosyncrasies, I’m not sure. I guess condition sensitive stuff. I keep my M.U.S.C.L.E.s separated by color out of an unproved theory that the colors bleed into one another thus explaining red marks on some of them. On a related note, I’m pretty sure those black specs that are hard to get off of some figures are blue marks from four pack packaging that have dirtied over the years. How important is figure condition to you? M.U.S.C.L.E. figure condition is very important to me. My set was built from only the best condition figures that I could get my hands on and are in impeccable condition with no marks. What do you consider to be the biggest flaw in a figure’s condition? The biggest flaw in a figures condition is ones with parts lopped off. Where are your figures kept? 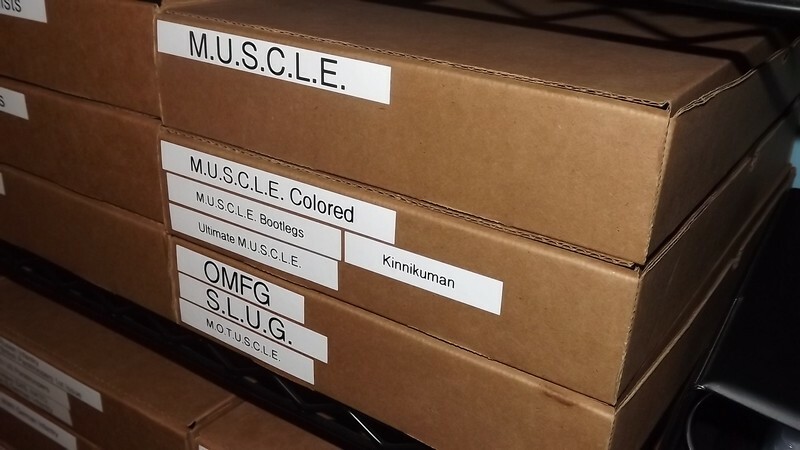 My figures are kept in labeled cardboard flat boxes that are stored three-ply on a heavy duty metal shelving unit that I bought from Uline. Most of my collections are stored this way. I do it for a number of reasons. One of them being easy access, my toy collection is quite large and needs to be stored this way to maintain accessibility. The other thing is that I don’t like getting dust on my collectables. And, lastly, I’d feel overwhelmed if I had everything on display. Those last two reasons are why I only have a few things from my collection on display at any time. And, then there’s, well, what I purchased from Matt’s collection from his sister that’s currently being stored in a black tote she shipped them over in. It’s the same tote that he stored them in. What do you think a MUSCLE figure is worth? Back in 2000, the going rate for M.U.S.C.L.E. figures was about twenty-five cents apiece with the exception of #153 and Satan Cross. At least that’s what I remember paying for them. Nowadays, I’d say around a buck a figure with the exception of those previously mentioned figures. Since the color code has been cracked, I guess there’s a slew of colored ones that go for a lot, though. Do you consider yourself an active member of the MUSCLE community? I do not consider myself to be an active member of the M.U.S.C.L.E. community. I completed my set long ago. How do you define the MUSCLE community? Defining the M.U.S.C.L.E. community would be difficult for me since I haven’t been an active member since the early 00’s. Back then it was a series of HTML based websites, Yahoo! Clubs/Groups, a mailing list, and in the case of Matt, Chris, and myself, three people that helped each other out with our collections and became friends. Chris was so cool that he rounded up the last few figures, including the claw that I needed and just sent them over to me as a gift. I remember I sent him a sealed colored ten pack the following Christmas as a gift, as well as hooked him up with the last Monsters In My Pocket figures that he needed. I still have a green Exogini figure he gave me. The three of us did go a long way to help each other. Matt was even cool enough to lay off auctions if I needed stuff in them. In other words, if I needed a piece or pieces in one, he wouldn’t bid. What would you like to see more and less of in the MUSCLE community? As to what I’d like to see more of in the M.U.S.C.L.E. community, I’m not sure since I haven’t been an active member. What do you expect to happen with MUSCLE in the future? I don’t expect to see much happen with M.U.S.C.L.E. in the future with the exception of more third party inspired figures and high priced Kinnikuman figures. What I’d like to see happen is the original figures released in the same quality of material, as well as mixed in with figures that never made it from the Kinnikuman line get made. I would like to see them in new colors so that they couldn’t be confused with the vintage figures. I would like to see the same packaging used. I guess I’d like to see this happen because I’d love to experience M.U.S.C.L.E. mania in stores again, as well as see a whole new generation of fans get into them. What would you like to see happen with the University of MUSCLE? As for the University of M.U.S.C.L.E., keep on trucking, man. This website is one of the best and I’m surprised how there’s always something new to say in regards to a line that hasn’t had a new product in decades. What other LRG’s do you collect? 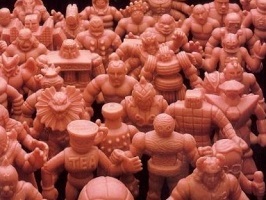 As for other little rubber guys that I collect, shortly after I completed my M.U.S.C.L.E. set, I got into collecting Mattel’s GUTS line and have everything from the line in stellar condition since it all came from sealed packs and boxes. In more recent years, I’ve collected S.L.U.G. Zombies, which my online friend and fellow G.I. Joe collector, Rel got me interested in. I’ve, also, collected OMFG figures, which were by far the most imaginative mini figure line released in recent times IMO with each one being a work of art that’s open to interpretation. I’ve, also, collected some of Super7’s M.U.S.C.L.E. like figures. What other LRG websites do you recommend as resources? 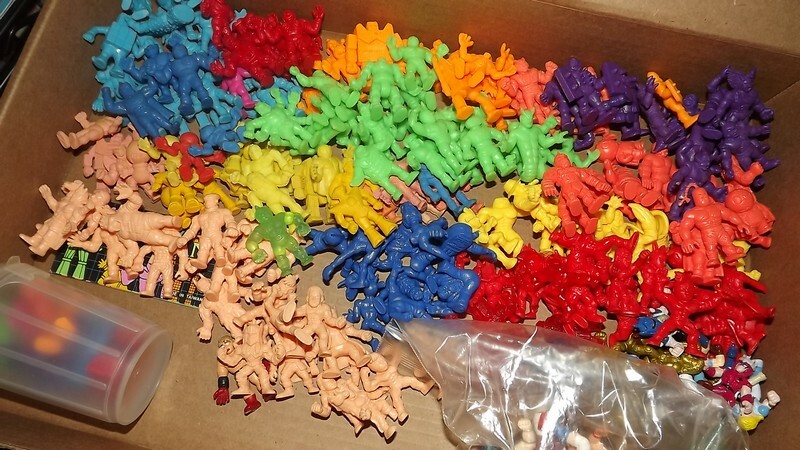 As for other Little Rubber Guys websites, there’s a blog called Little Weirdoes that rocks just because of the sheer amount of mini figure lines it shows that I had no previous idea as to existing or had forgotten about. What collecting tips would you offer to collectors? As for collector tips, well, a toothbrush and running your M.U.S.C.L.E. figures under a faucet will get ’em pretty spiffy looking if you get dirty ones in a lot. Also, rubbing alcohol on toilet paper can remove a lot of marker stains. I’ve even been able to remove blue marks that are from four pack packaging. 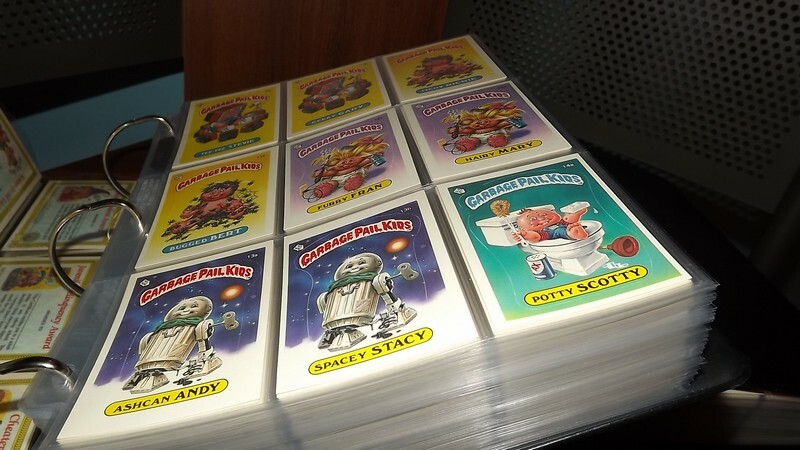 Other things that I collect/have collected are Garbage Pail Kids cards (I have all 15 original series. 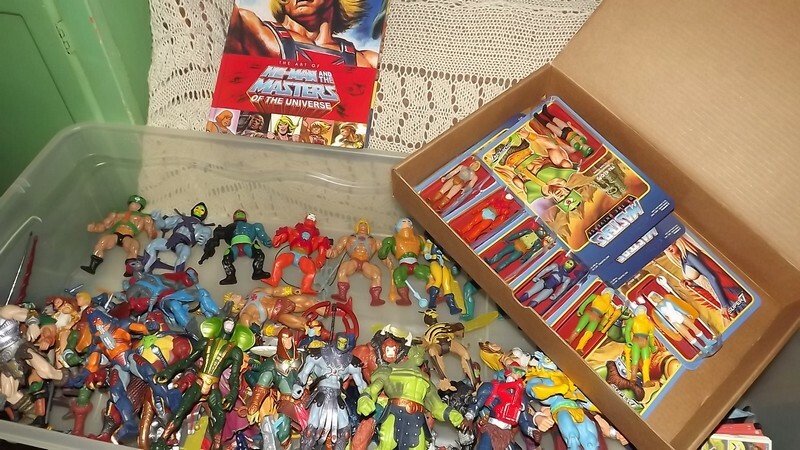 ), Masters of the Universe figures, G.I. 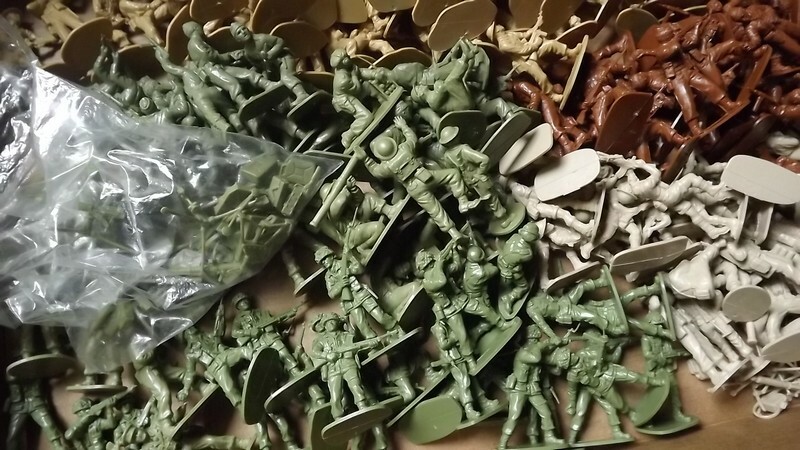 Joe figures, Transformers, WWE flashback figures, quality plastic toy soldiers such as Airfix’s and Toy Soldiers of San Diego’s, Diecast WWII military vehicles, military history books, and music CDs. How does your family/friends/partner/etc. react to your collecting? I don’t have a lot going on in terms of family and friends at the moment, so I can’t really comment on how they feel in regards to my collecting. I was a care giver for eight and a half years and it left me with very little time for social interactions. I was initially one for my father for three and a half years who passed away in 2011 of advanced Parkinson’s Disease. I was briefly one for my mother who passed away from Cancer in 2013. And, I was one for my grandmother from 2011 to 2016 who passed away in 2016 at ninety-seven from heart problems. It’s been rough with all of them gone and losing two friends in their thirties. Family and friends were always cool with my collecting in the past, though. It, also, runs in my blood with my dad having collected toy soldiers and model kits, and, also, my grandfather having been a stamp collector, his childhood stamp collection being something that I still own. He passed away in 1984. As for other statements, I’d like to tell my story of how Matt, Chris, and I all met online while collecting M.U.S.C.L.E. back in the 00’s as well as go into my recent acquisition of Matt’s collection, the last of which is what got me to submit this piece to your website. It would be cool if you could work them into this sociology piece. Oh, and I have an odd retail siting of M.U.S.C.L.E. figures that I would like to share. I’ll type that right now. Back in the early 90’s, there was a store that opened up at a local mall that was a dollar store. 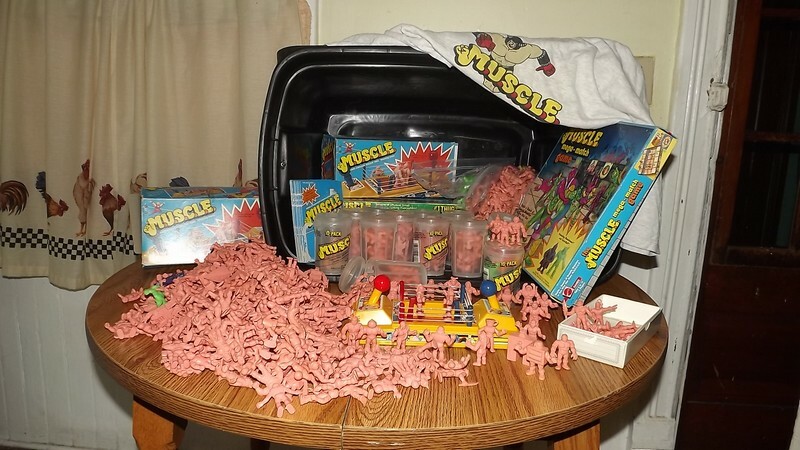 I was knocked for a loop when I came across a massive amount of flesh colored M.U.S.C.L.E. four packs which I hadn’t seen since the mid-80’s for a buck each. They might have been cheaper. They were case fresh and pristine. It was surreal. I didn’t buy one of them. It’s one of my biggest collecting regrets. 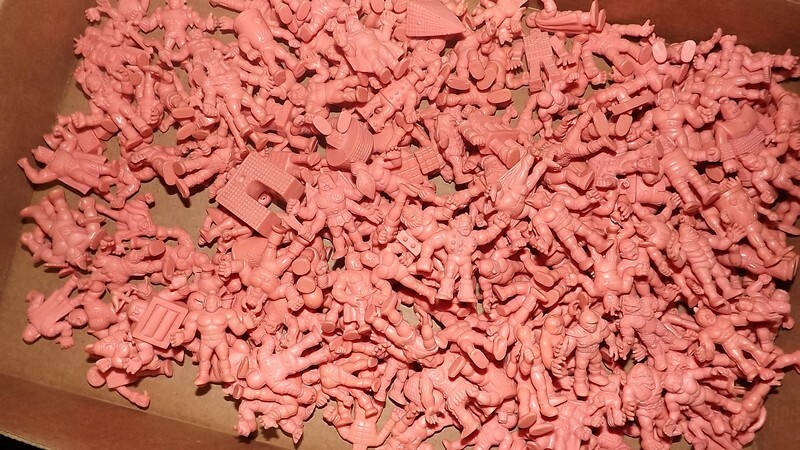 Late one night, during the spring of 2000, I sat at my computer desk to bid on an auction for a lot of flesh colored M.U.S.C.L.E. figures by Mattel. The desk, along with my first computer, was given to me by one of my mother’s coworkers who worked with her at social services. The computer I was using at the time was the very first one I bought, a Gateway Essential with it’s almost thirty pound EV500 monitor. The chair I was sitting at was just a metal folding chair. I didn’t get a proper chair for my computer until a few years later. The lot of M.U.S.C.L.E. figures I was bidding on contained a rare figure who was originally referred to as X1 throughout the online community. The figure did not appear on the official poster/checklist. It, also, had a hole in its back, which puzzled collectors. After the original Japanese property, Kinnikuman that the line was based on became known in the United States, it was revealed that X1’s name was Satan Cross and the hole in the figure’s back was for an extra torso with legs to plug into, which gave him a Minotaur like appearance. The additional piece never made it into the M.U.S.C.L.E. line. The auction already had a bidder on it and for some reason I wasn’t going to bid, but within the last minute of the auction, another bidder sniped the auction. For whatever the reason, this made me go for it and place my bid with only a few seconds left. I won the lot. I was pretty happy because I got a lot of nice figures to help me to complete my set and I got a rare figure. It was a deal. If the auction had a better title, I’m sure it would have had a lot more bidders than just three. Not long after winning the auction, I turned in for the night. The next day, I received an email from the original bidder telling me that the lot had a rare figure in it and to guard it with my life. The bidder, Matt, also, told me that I was lucky that he was away at work that night. I decided to reply to his email and we started to exchange them on an almost daily basis. We mainly talked about M.U.S.C.L.E. and some of the other things that we had collected. Sometime during the following summer, I got an email from a fellow eBayer, Chris who wanted me to take some figures out of a lot of M.U.S.C.L.E. figures that I had listed. I had to decline because it involved too much work. Back then, taking a digital picture and having to host it on Tripod took some doing. You had to have a host for eBay auctions back then. Pictures couldn’t be directly uploaded. Regardless of this, Chris and I started emailing back and forth about M.U.S.C.L.E. 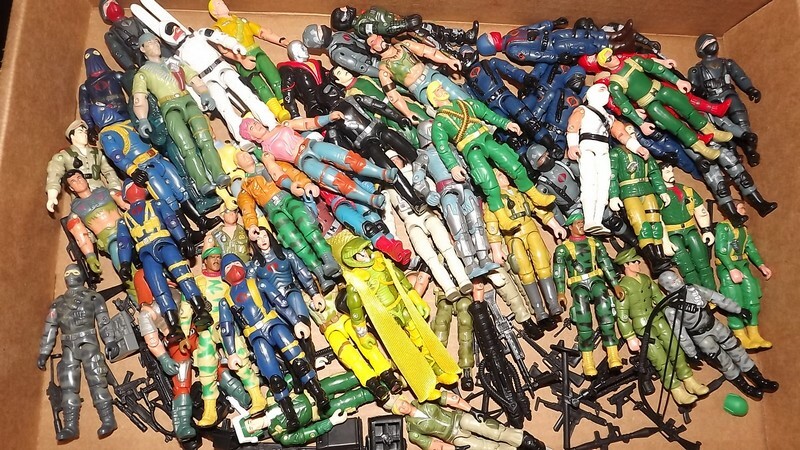 figures and other toy lines from our youth that we had an interest in. During an email to Matt, I mentioned Chris. 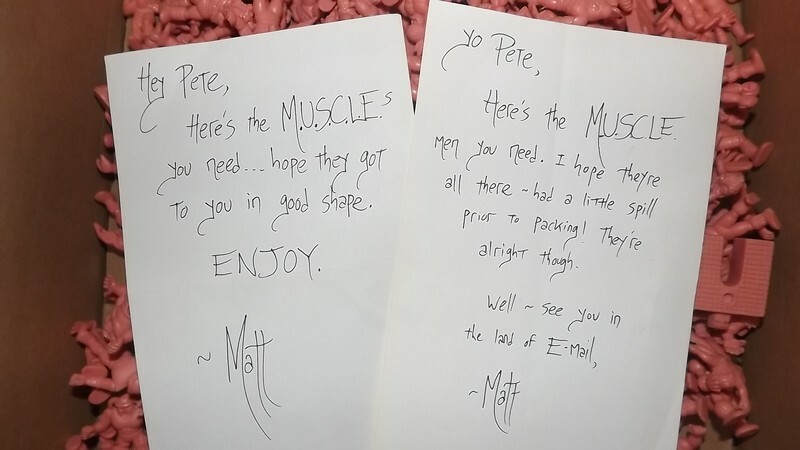 Matt said that he knew Chris already and that he had M.U.S.C.L.E. figures that he was supposed to buy from him still sitting on his desk. I repeated that to Chris and Chris was surprised that I had, also, known Matt. Coincidentally, Chris had been the other bidder in the lot that had the Satan Cross figure in it. He was the one who sniped Matt and got me to snipe the auction, as well. Without Chris, I would have not met Matt. Later on, we would spend hours getting to know each other better by chatting with each other on AOL Instant Messenger and Yahoo! Instant Messenger. While Chris and I didn’t see eye to eye on things like music, Matt and I did and we had a great many things in common. Chris and I had a lot of other things in common, though, like a mutual interest in toys, video games, and animation from the 1980’s, as well as an interest in paranormal activity. In 2017, six years after Matt’s passing, I was emailing with a friend and band mate of his by the name of David. David emailed me one day saying that he had talked to Matt’s sister who was saying she was looking to sell some of his collectables. She got in contact with me and I bought what she had left of Matt’s M.U.S.C.L.E. collection, which was around five hundred figures, cans (One of them still sealed. ), packages, two rings, a board game, and even a t-shirt from back in the day. While it was an incredible acquisition and a lot of fun to go through, it was, also, an emotional experience with me being a friend of Matt’s, as well as a fan of his music. David and Matt’s sister said that they’re glad that it found a good home and I have to agree that it did. I hope everybody enjoyed Peter’s effort. I certainly did – thanks again Peter! This entry was posted on Tuesday, August 8th, 2017 and is filed under Sociology, UofM News. You can follow any responses to this entry through RSS 2.0. You can skip to the end and leave a response. Pinging is currently not allowed.